August 27 - Saint Monica, Mother of St. Augustine - Memorial - My Catholic Life! Most of the female saints of the first few centuries of the Church are virgins, martyrs, or both. Most of the medieval and modern female saints are nuns, especially foundresses of religious orders. Married female saints are relatively rare. With some few contemporary exceptions, they are the mothers of kings, of emperors, or of other canonized saints. 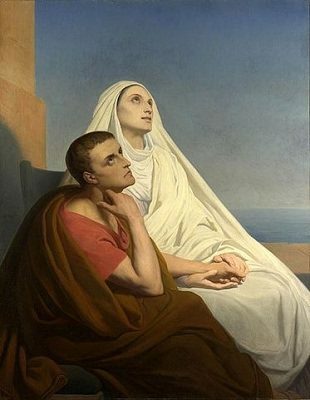 Saint Monica is the mother of Saint Augustine. She was raised in a Catholic family in long extinct Christian North Africa, probably in the small town of Tagaste in modern day Algeria. Tagaste had been Christian for over two hundred and fifty years by the time Monica was born. So although she was born long ago, just after the Council of Nicea, her family’s faith was likely deeply rooted. Monica married a nominal Christian named Patricius who was a difficult man. His early death left her a widow at forty. Monica and her husband wanted their gifted son Augustine to receive the best education possible, so they sent him away for schooling. And there Augustine fell into the serious and enduring moral and theological errors which would form the central drama of Monica’s life. It is said that all of the plots in the world can be reduced to just five or six. One of those is “Get back home.” Saint Monica’s life was dedicated to getting her son back to his home, the Church. She wept, she prayed, she fasted. Nothing seemed to work for fifteen years while her son strayed far from the Catholic path, seemingly without remorse. In the midst of her spiritual trials and sufferings over Augustine, Monica had a vision. She was standing on a wooden beam. A bright, fluorescent being told her to dry her eyes, for “your son is with you.” Monica told Augustine about the vision. He responded that yes, they could indeed be together if she would just abandon her faith. Monica immediately retorted: “He didn’t say that I was with you. He said that you were with me.” Augustine never forgot her quick and insightful answer. In Milan, Monica befriended the great Saint Ambrose, who played such a key role in Augustine’s conversion. The seed of her prayers bore fruit when Augustine abandoned his sinful life, was baptized, and decided to return to North Africa as a Christian leader. Her son had come home to the Church and was returning to his native land. Her life’s mission accomplished, St. Monica died in her late fifties in the Roman port of Ostia, while waiting to board the ship to cross over to Africa. In her final hours, Augustine asked if he should transport her body to Tagaste for burial next to her husband. She said she was happy to be buried wherever she died, for “nothing is far from God.” Her remains are now found in the Basilica of Saint Augustine in central Rome. Saint Monica, you were persevering in your efforts to straighten the crooked paths of your son’s life. Your prayers, pilgrimages, fasts, and words were fruitful, but only after many tears. Help us to be as concerned as you for the immortal souls of those who are close to us.